I’ve taken to surveying my students on or near the first day of school. Last year’s surveys taught me much about the kids right out of the gate — I was able to engage the Belieber about her favorite song and the Marvel fan about her favorite characters, for instance. As I wrote my survey this year, I wanted to add a few quirky questions. Naturally, I hit up Twitter for advice. @mgolding how much change (in cents) do you have on you right now? @mgolding If you weren't sitting here right now, what'd you be doing? @mgolding in front of class or private survey? In survey, I ask, what would you like me to know about you that most people don't know? Other ideas included favorite mythical creature, 2 truths and a lie, and favorite superhero (with justification). @mgolding it's shocking really. I ask them their fav subject and why, if they think their good at math. Are u taking @joboaler's course? 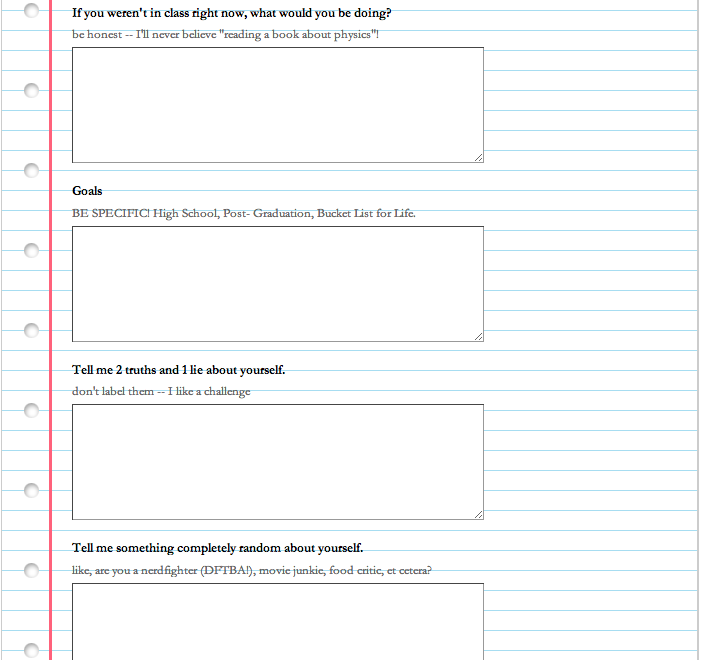 That said, here’s the survey I whipped up with the help of my awesome daughter (she’s 16 going on 17) and the advice of my Tweeps, above. Anyone else want to share their fall surveys? I’d love to see what you ask your kids. Drop the links in the comments. This is post 10π on the blog. I should’ve paced myself better — first post was October 2004. 10π posts in 10 years would’ve been the most amazing thing ever. 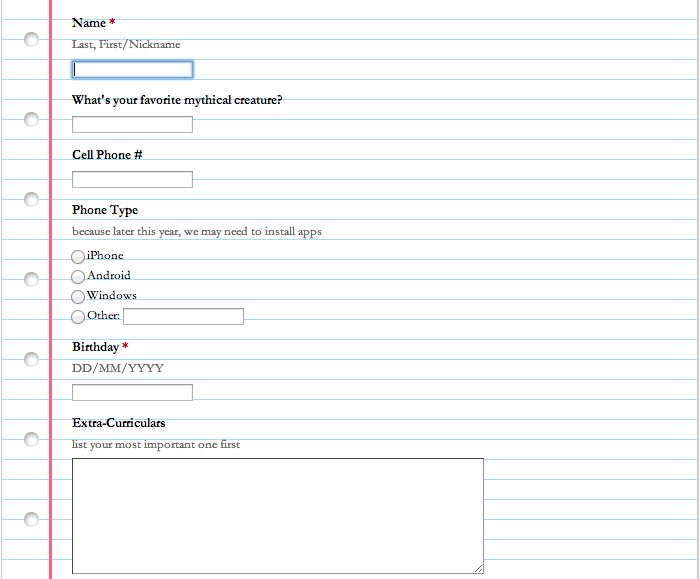 I’ll use Google Forms but I haven’t set them up yet. I love your last 2 questions! This one is a little lame, but I wanted to contribute and tell you that after I collect these, I write one for the kids and answer their questions. Wow! You are so motivated, and way ahead of me. Maybe I’ll get something done tomorrow so I can share! Thanks for sharing your survey! I love learning from the decisions other teachers make about this sort of thing. I second Julie’s suggestion. I word it something like, “Is there anything going on with you that you would like me to know about?” You get a heads-up on family tragedies and the like. Also suggest “What’s your favorite thing on the Internet right now?” for novelty, and so you know what the heck they are talking about half the time. Also ALSO suggest re-visiting the survey halfway through the year. I stole the idea from Dan, I think, to have kids draw a self-portrait on theirs. I had them all queued up for a day when we had 5 minutes to kill, we played a little “who is this?” guessing game. Big fun. I used to do these surveys and read through them and forget them. Now I force myself to take the time to write each kid a semi-personal email based on the questions I ask, just so they know I read their answers and I care about them… from the very start. About half the kids share they are nervous about something — so I always let them know that they shouldn’t be nervous, that I’ll always be here for them, and that together we’ll make sure get over any anxiety they have. I love your quirky questions! I do short surveys for the first day with vital information I need to know. But this year, I’m also going to have them play Jenga with questions written on it. When they pull a piece they have to read the question and answer it. I’ve been looking for more questions to put on it, and these are perfect! Thank you! Great idea, love the Jenga! Do you have more than one Jenga set for the class? I’m a special ed teacher and have a max of 10 students per class so ideally I’d have 2 sets. However, my class numbers are really more around 5, so I just have one for now. Here is my survey. We chose the same notebook paper theme!